Letter by patient 'to Dr Cullen, made in answer to the Doctor's Queries'; evidence from other documents in the case suggests that the patient in question is Mr Dirom, in whose handwriting the letter is written. This may be the additional report to which Doc [ID:5548], dated 8 October 1787, is the response, so perhaps should be dated to early October 1787. 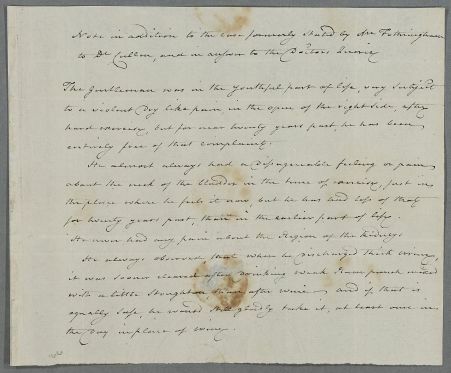 Summary Letter by patient 'to Dr Cullen, made in answer to the Doctor's Queries'; evidence from other documents in the case suggests that the patient in question is Mr Dirom, in whose handwriting the letter is written. This may be the additional report to which Doc [ID:5548], dated 8 October 1787, is the response, so perhaps should be dated to early October 1787.
to Dr Cullen, and in answer to the Doctors Queries. entirely free of that complaint. for twenty years past, than in the earlier part of life. He never had any pain about the Region of the kidneys. the day in place of wine.